Cost to install a basement staircase varies greatly by region (and even by zip code). Get free estimates from stair contractors in your city. Cost to install a basement staircase varies greatly by region (and even by zip code). Get free estimates from stair contractors in your city. The average cost for installing a basement staircase is $1,500. How much does it cost to install a basement staircase? A staircase allows you to easily access your basement. If your home is older it might have a rickety staircase that you want to replace with a sturdy, well-built structure. 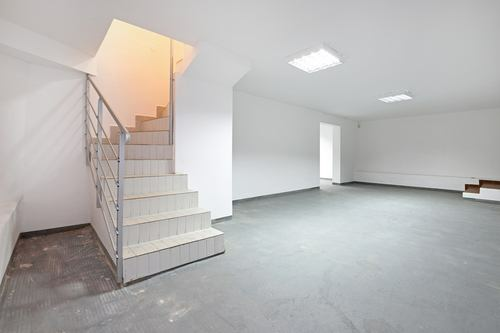 All staircases require accurate measurements and should be constructed with safety in mind, but basement stairways are usually dark and often not constructed with standard or common dimensions. The cost to build a standard flight of pine basement stairs that go down one story, featuring the standard 13 treads for a total length of 130 inches or 10 feet 10 inches, averages $1,000-$2,000. The basement may not have the proper height required to install a staircase according to the requirements of a building code. A basement may not be well lit and cramped so difficult to work within the confines. Most basements have a set of straight stairs. However, some people might opt to construct other staircase designs which can increase the price of the staircase. The amount of space that a stairway takes up will depend on the size and height of the basement. You must measure the distance from the location on the floor of the bottom stair up to the top of the stairs to find out the total rise. One of the key parts of a stairway is the railing 1. The railing provides a handhold as person ascends or descends the stairway. It is used not only for safety, but also as a decorative addition. You can also opt not to have an open railing and instead enclose the stairway, though depending on the height of the staircase you will probably still need a handrail 1. Balusters 2 are optional, decorative pieces that can be added to the space between the handrail and the steps. Also called spindles 3 or stair sticks, they can be fashioned out of wood or other materials to match the railing and stairs. They range in price from $100 to $1,000 each depending on the material and design. Some balusters are extremely decorative. When building a staircase, you will need to determine the size of your stairwell so that you will have adequate headroom to accommodate the stairs. Remember that you will need to ascend and descend the stairs safely. The area where the stairs will go must be flat and free of debris. You may want to use an architect to design the staircase blueprints 4. Most architects charge $150 or more per hour. You must measure the floor-to-floor height to determine exactly much room you have available to fit the staircase. You must always take into consideration the headroom, especially in a basement, so that there is clearance at all points on the stairs. The measurements will help you factor in the number of stairs required to finish the stairway. You will need to determine if the staircase flows down one wall or is going to be open. To determine if the stairs will fit between two walls you must measure the width (wall to wall). The slope of a stairway is is a 7 inch rise and an 11 inches tread. This means that you will have 7 ¾ for the riser and a minimum of 10 inches for the tread. These are the basic measurements to pass a building inspection in the United States to ensure that you are building a safe and usable stairway. The side wall beside the staircase might benefit from the addition of decorations or hooks. The process of building stairs requires several skill sets. An architect will determine the size and style of the stairs. Most architects charge 10-17 percent of the total cost of the stairway. A civil engineer draws up the blueprints of the staircase and typically charges $100-$130 per hour. A handyman will be used to construct the stairs. Depending on the region, most handymen charge $60-$90 per hour. An electrician can install stairway lighting or electrical outlets and will usually charge about $65-$85 per hour. The space under the stairs may seem useless but it can actually be used for storage. 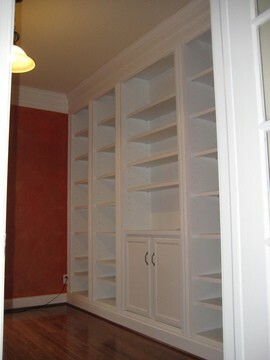 The best way to to transform it into storage is to install built-in 5 cabinets under the stairs. Generally, it is considered a medium construction job, requires about 2 to 4 hours of labor, and averages $200. A small room constructed below the stairs will cost $300 or more, depending on the size of the room. To install plumbing into the small room to create a complete washroom will cost an additional $2,025-$2,925 for all plumbing and fixtures. Framing and installing a door is another option that many people undertake when installing a stairway. To frame and install a door for your staircase will average $500. Carpeting or painting stairs is a common finishing touch. The cost to install carpet averages $3-$6 per yard strictly for labor. Cost to paint stairs averages $0.50-$1.60 for paint per stair. To save money, you can have the stairs built parallel to the ceiling joists to reduce installation time and materials. To personalize wood stairs, consider adding stencils 6. The average cost of stair decals averages $22-$45 for a complete set. Heating equipment can be dangerous if placed in a home’s basement. Basements are often moist which can damage the HVAC equipment. Additional equipment should be installed to control the moisture and keep your family healthy since excessive moisture can spur dangerous mold growth. Always have a licensed HVAC company handle all heating and air installation in a basement because it involves the use of high voltage wiring and other specialized skills. When installing basement steps, remember that some regions require a specific slope for safety. A steep incline is harder to walk down and a person can fall more easily on such stairways. A gradual slope is far easier to traverse. Many regions of the country require specialized permits and all stairs must be built to specific code requirements as set forth by the International Building Code. You can decide to build stairs yourself trying DIY pre-built stairs. How long is a staircase for 9-foot ceilings? The rise is 11 feet. How high does a stair railing have to be? How wide do basement stairs need to be? The width of the stairs must be at least 36 inches wide. How do you build a staircase? You first determine the size and type of staircase required. You can then figure out what materials you require and the various costs of the different tradesmen needed to complete the project. How much does it cost to install hardwood stairs? The cost is approximately $110 per step. 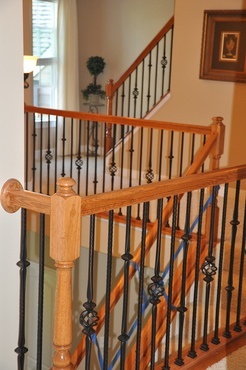 How much does it cost to install stair railings and balusters? The cost averages $3,300 for all railings and labor. How much does it cost to install a basement staircase in my city? Cost to install a basement staircase varies greatly by region (and even by zip code). To get free estimates from local contractors, please indicate yours. New information was added, such as the pros and cons of staircases, the different types of staircase designs and the main components. There are some installation considerations and information on the labor process. There is now a section dedicated to enhancement and improvement costs and another that contains additional considerations and costs. Finally, all prices were updated and a summary stating the price as well as a “FAQ” section was added. The image for this guide has been changed as well. 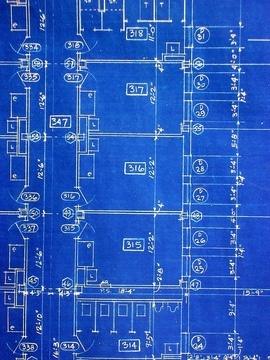 A technical drawing of an architectural design. Traditionally these were made using a printing process that produced a white line on a blue background. They can also be made with CAD software and a large-scale printer. Cost Considerations: Stenciling averages $8 to $11 per square foot ($4,800 to $6,600 for a 12'x18' space).